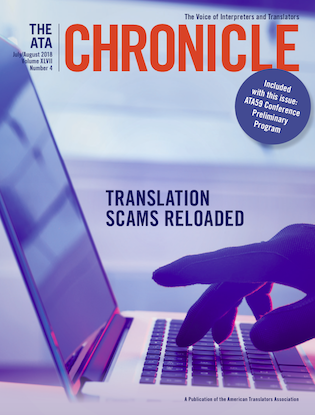 My new, updated article about scams in the language industry just appeared in the July/August 2018 edition of The Chronicle, the journal of the American Translators Association. You can read the online version of the article here. CFB Scientific Translations Wishes You a Prosperous 2019! © 2010-2019 CFB Scientific Translations and Consulting. All rights reserved.